Okay, so I’m like DYING to try peanut flour! But there aren’t any Trader Joe’s in Florida and I’m too cheap to order online. For the time being, my homemade peanut flour meal will have to do! I blended roasted peanuts until fine but still a little chunky. If I had blended any longer, I would have had the beginnings of peanut butter! 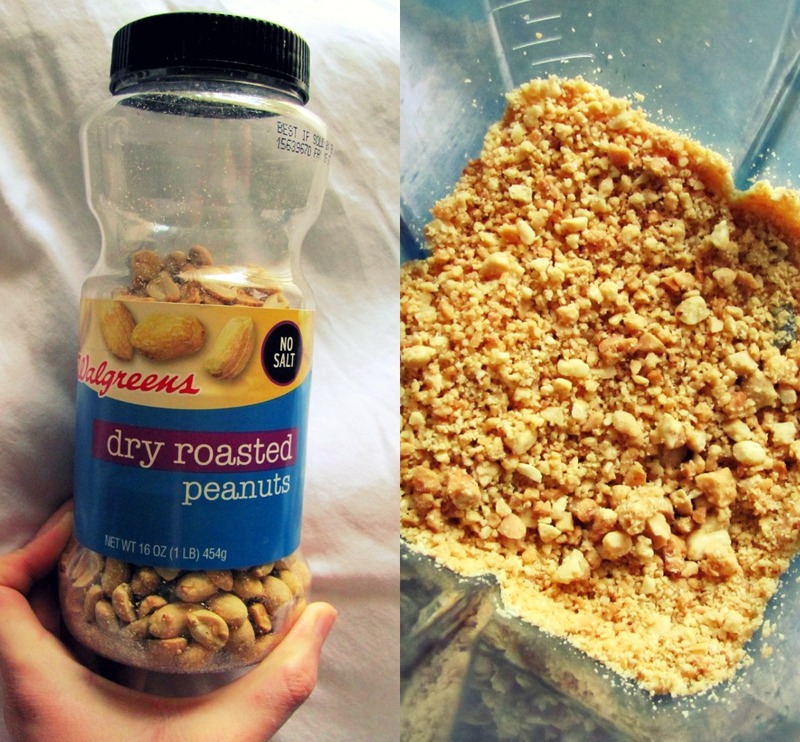 Peanut flour is made from pressing the oil out of the peanuts then pulsing them. So my peanut meal is more oily and chunkier than peanut flour. But, really, how different could they be? So I made Carrie’s Inside-Out Peanut Butter Cup Cake. 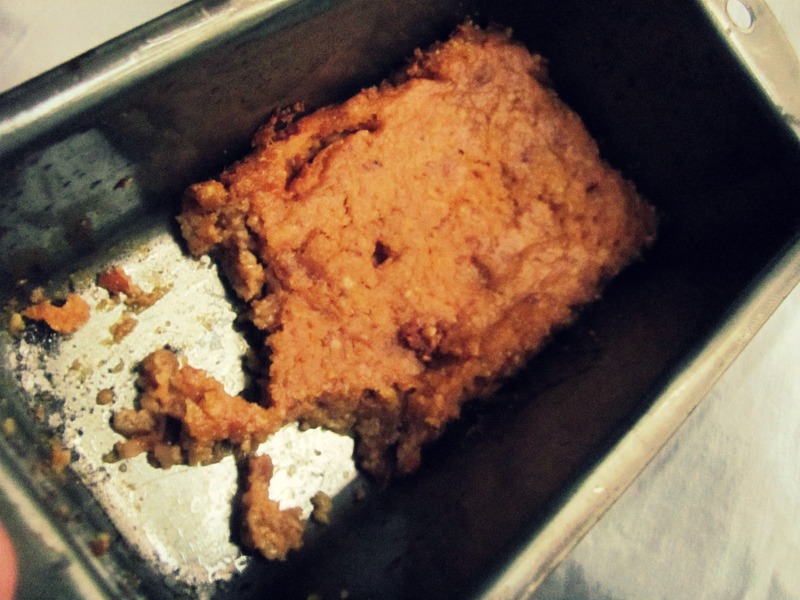 Sadly, it was extremely moist, even after baking for 10 minutes longer than called for. I’m guessing from the peanut meal. And I used a little stevia, but I wished I had used some honey to sweeten it up, I’m starting to not love stevia that much. It was a very weird-sweet flavor. And this morning for breakfast I could not get a peanut butter dark chocolate waffle off my mind. So this happened. 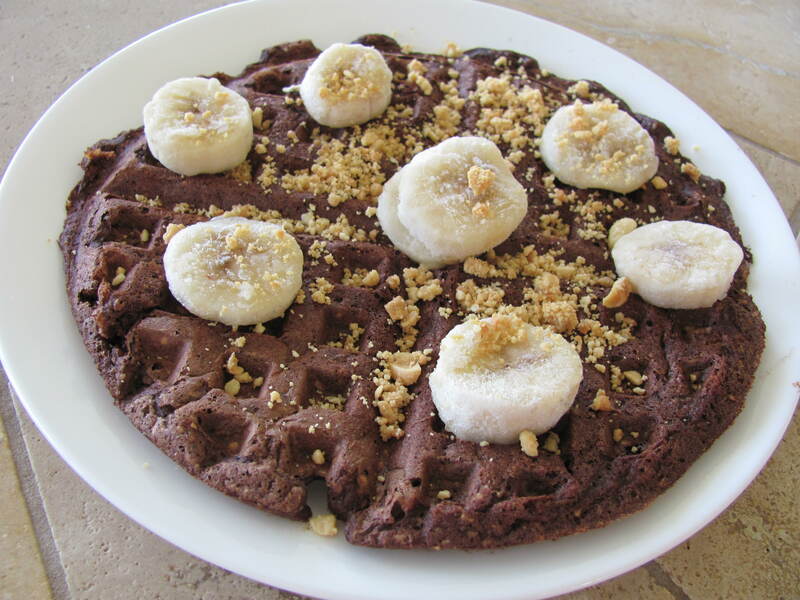 A delicious dark chocolate peanut butter waffle, topped with frozen banana slices and sprinkled with more peanut meal. The cold sweetness of the frozen bananas is just pure delightful on top of the warm waffle! 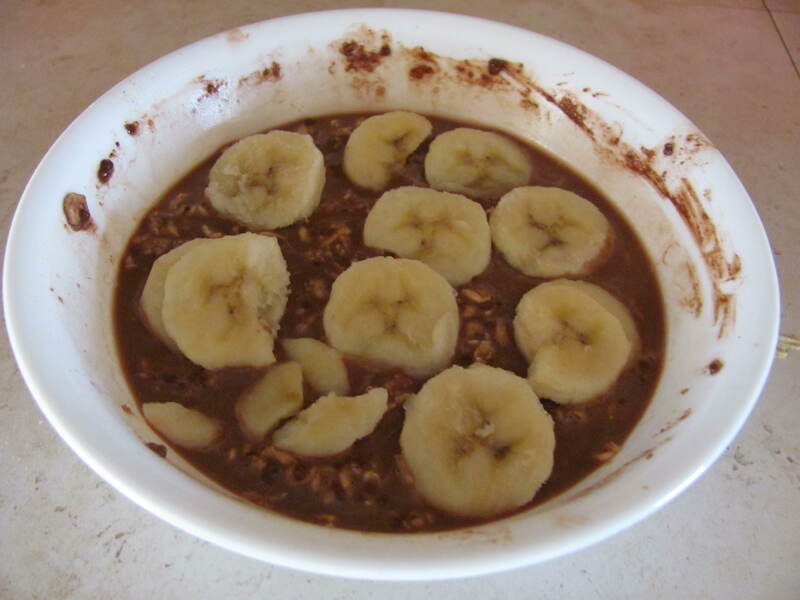 I’ve also been putting frozen banana slices on warm oatmeal! I got that idea from Julie. 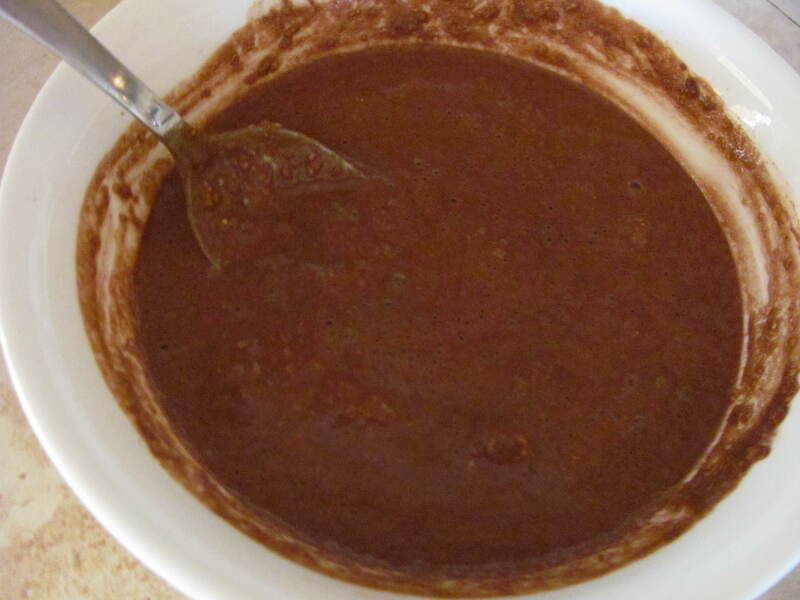 The above oatmeal was just 1/2 cup oats, 1/2 cup skim milk, 1 T. chia seeds and 1 T. cocoa powder soaked overnight. No sweetener needed, because in the morning I topped with frozen banana slices, sooooo gooood. 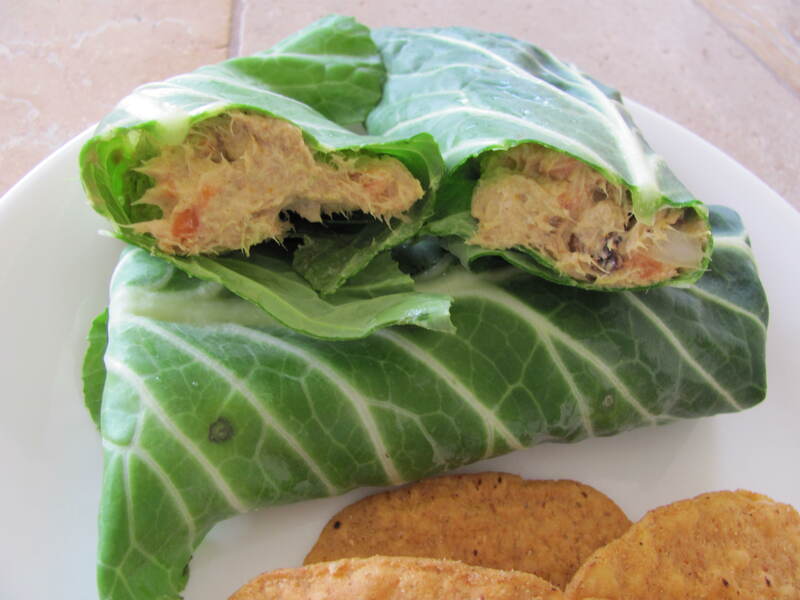 I made up some curried tuna salad from The Nutrition Diva’s Book that I was sent to review. I’ve been trying to use up all the collard greens I bought a while ago. They’re going bad in the fridge and I’ve only used them twice! 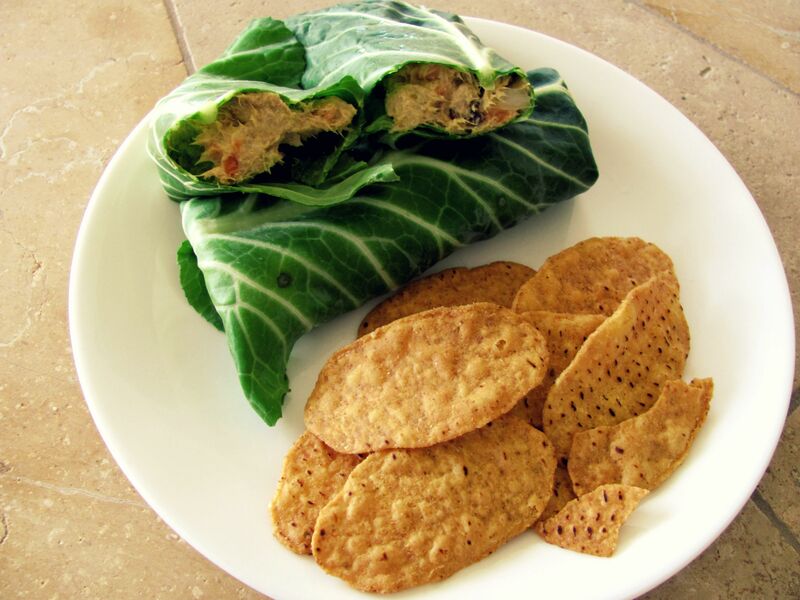 My collard green wraps turned out quite nicely, if I do say so myself! The only problem was the curried tuna wasn’t all that great. Me and my mom both weren’t really fans of it, kinda weird tasting. But I am hopeful for some of the other recipes in the book! On the side there are the most delicious Sweet Potato Chips I’ve ever tasted from Food Should Taste Good. 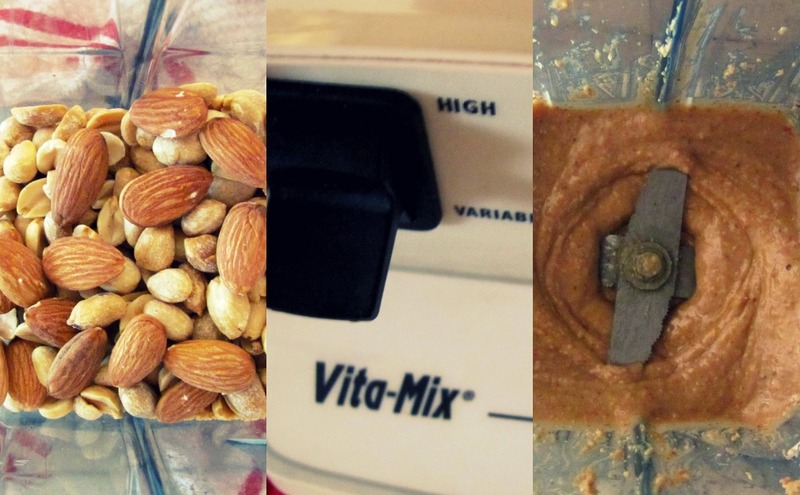 so I whirred up some fabulous homemade peanut butter with the rest of my peanut meal, peanuts and a little handful of almonds. And I got some delicious, drippy peanut butter….yumm. 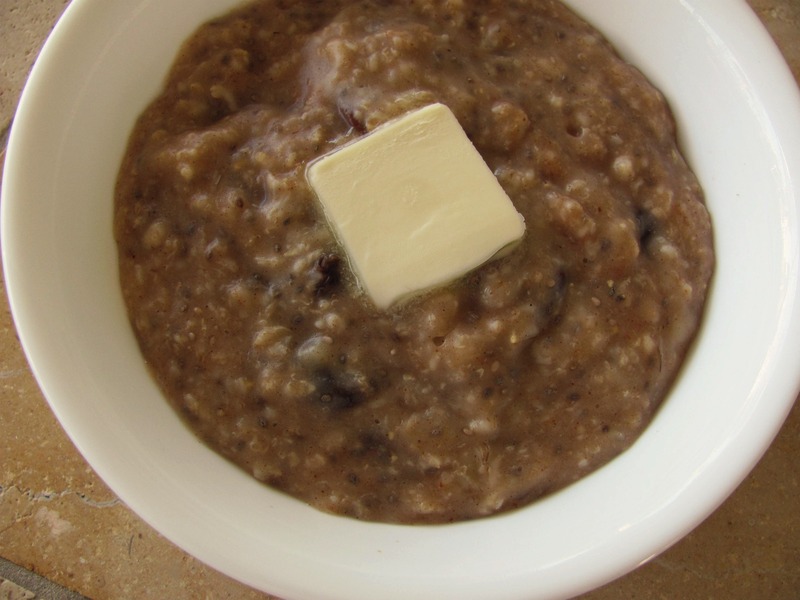 The other day I could not get the cinnamon-raisin combo out of my head, so I had to make some oatmeal! Delicious raisins in every bite…Me and mom both agreed that this was the best oatmeal I’ve ever made. And the butter on top was a great addition, I’m not scared of butter any more! 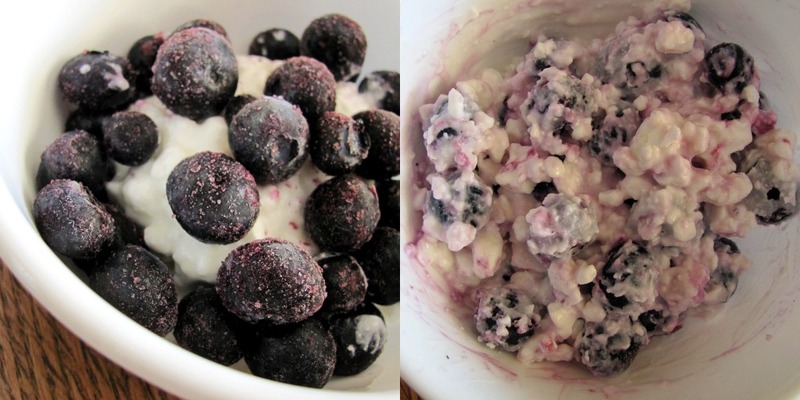 One of my favorite snacks right now is cottage cheese and frozen blueberries. Another favorite snack lately are these Perfect Foods Bars I was sent to review. This is the Almond Butter flavor. Tastes like cookie dough, not even kidding! And trust me, I know cookie dough. Basically, the Perfect Foods Bars are made with a base of peanut or almond butter and honey mixed with a bunch of super whole food powders including spinach, orange, lemon, tomato, red bell pepper, apple, cherry, celery and lots more! It’s amazing because you can’t even taste them! I eat 4 times a day and 300+ calories every time I eat. The bars are a perfect 4 o’ clock snack for me clocking in at about 300 calories, 18g protein, fat and lots of vitamins and nutrients to tide me over until dinner. I was really wary to try this SoyJoy bar. It really didn’t appeal to me. I mean, a bar made with mostly ground whole soybeans? It sounded kinda gross. I’m so glad I ended up trying it! Please note, that I don’t take photos of everything I eat, only the fun stuff! And what you see on my blog isn’t necessarily all my diet consists of, I promise I don’t eat chocolate waffles and bars all day! What’s your favorite snack? How many times a day do you eat? I LOVE frozen banana slices on warm oatmeal or a warm english muffin. 🙂 yyuuuuumm! my fav snack is deffos banana with pb! That waffle looks incredible, and cinnamon raisin oatmeal is one of my favorite combos! I eat 4-5 times a day, if I have a hard/long workout, I’ll eat more often. My favorite snack is raisins & nuts! Yes, you could! I actually adapted my waffle recipe from a pancake recipe, so go for it!! I don’t really count how many times a day I eat, which is so unusual for me. I used to eat 4-6 times a day religiously. It got too stressful, so now I just eat when I’m hungry. It still probably comes out to around 4 or 5 times. I’m sooo sorry about the peanut flour thing! Yeah, the extra oil would’ve definitely messed it up. I wonder how on earth you press oil out of peanuts? Delicious nut butter and waffles!! I eat at least four times a day. I love eating smaller meals throughout the day. I don’t get people that skip meals! I eat about 6 times a day….some of my favorite snacks are yogurt, granola bars, dry cereal, half sandwiches, etc. I usually eat 5 times a day! I have yet to try frozen bananas! I only make smoothies with them so i’ll have to try them other ways soon! My favorite snack is a slice of whole wheat bread with some peanut\almond butter! Um how many times a day do I not eat? I am seriously always eating ha. My favorite snack at the moment are smoothies but I’m sure it will change by next week. No but really. You have a fabulous blog…. I love your ideas and the healthy way of cooking!! The waffles look amazing girl! Yummy!! Im sorry you can’t get peanut flour there, yeah I ordered online, i was desperate! ha! My favorite snack is and always has been cereal. Dry, with milk, in pudding..anyway! I’m digging those meals and recipes you posted. I have to try them out. You make them look so easy to create. Maybe they are and I’m just lazy. I love Soyjoy’s! I got a bunch for free after a race one time. The peanut butter cake still looks really delicious to me!! I love snacking, and I tried that Soy Joy too! You sent it to me 🙂 I thought it was like banana bread too! OMG girl!! So first, I was just about to try making peanut flour EXACTLY like you did because I so want some!! Second, I bought those sweet potato chips for the first time this weekend and LOVED them. Third, I just bought some Soy Joys and can’t wait to try them! Ahhhh! Perfect Food Bars- My favorite bars in the world! Unfortunately, I found them and grew to love them on the West Coast and then moved out East where I can’t get my hands on them. They are by far my favorite bar, especially the lite one with cranberries and PB. So jealous! I eat a lot. Usually 4-5 small meals. I like a nice sized breakfast, lunch, and dinner but I also included protein smoothies and wholesome snacks on a good day. Oh wow this all looks so good, I love oatmeal (porridge we call it in the UK) so much, I love the look of the one you made, raisins in it are always a major yum factor! I love to snack on fromage frais, and apples & fruit of any sort & normally eat about 4 times a day depending on what I’m doing.